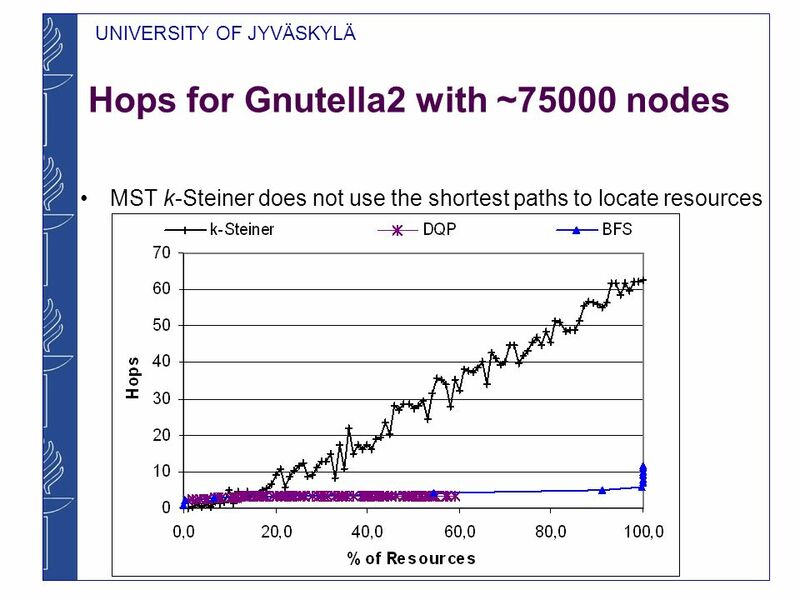 Optimal Resource Discovery Paths of Gnutella2 The IEEE 22nd International Conference on Advanced Information Networking and Applications (AINA 2008) 27.3.2008. 12 the approximated solution is also the optimal solution. 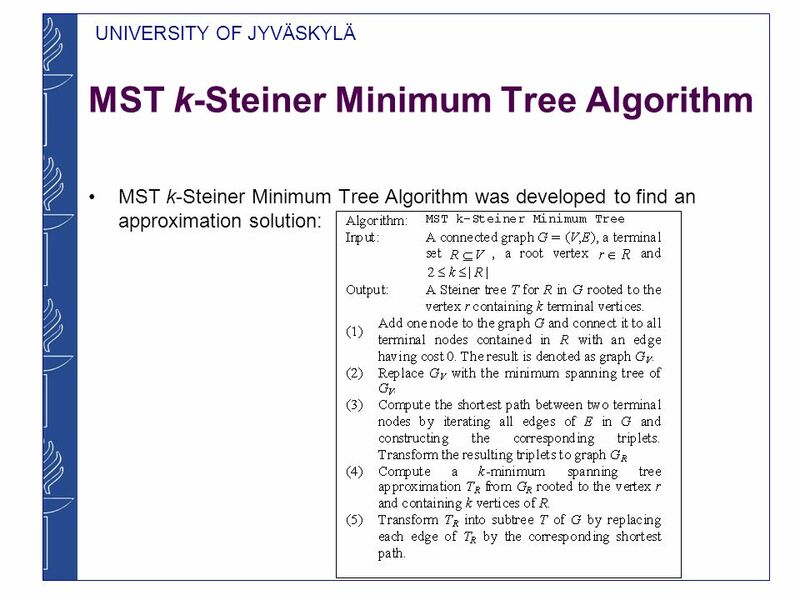 Highest Degree Search K-Steiner Minimum Tree K-Steiner Tree Algorithm locates 9 resource instances with 11 query packets. For this query the approximated solution is also the optimal solution. HDS uses almost twice as much query packets for this query. Download ppt "Optimal Resource Discovery Paths of Gnutella2 The IEEE 22nd International Conference on Advanced Information Networking and Applications (AINA 2008) 27.3.2008." Performance in Decentralized Filesharing Networks Theodore Hong Freenet Project. 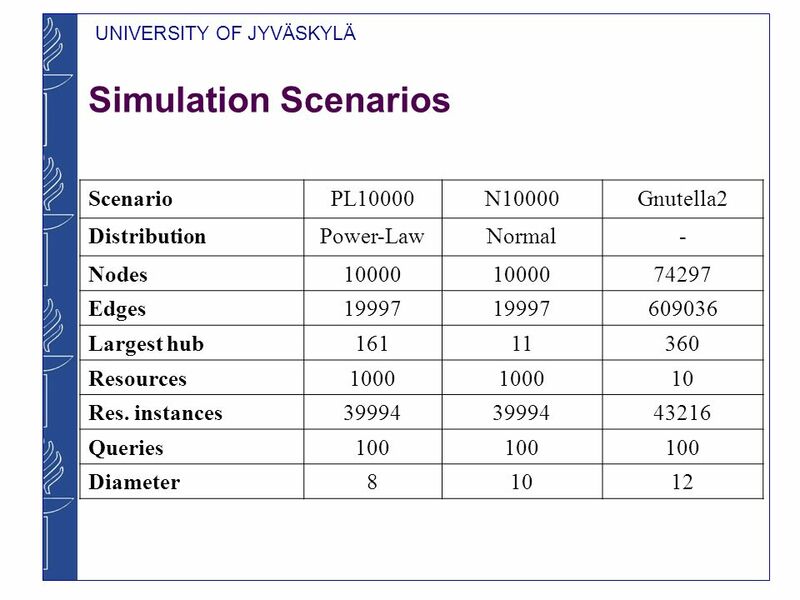 UNIVERSITY OF JYVÄSKYLÄ Chedar: Peer-to-Peer Middleware Presentation for 8 th International Workshop on Java tm for Parallel and Distributed Computing. UNIVERSITY OF JYVÄSKYLÄ P2PStudio – Monitoring, Controlling and Visualization Tool for Peer-to-Peer Networks Research Presentation for PM 2 HW 2 N on 2. UNIVERSITY OF JYVÄSKYLÄ Mobile Chedar – A Peer-to-Peer Middleware for Mobile Devices Presentation for International Workshop on Mobile Peer-to- Peer Computing. 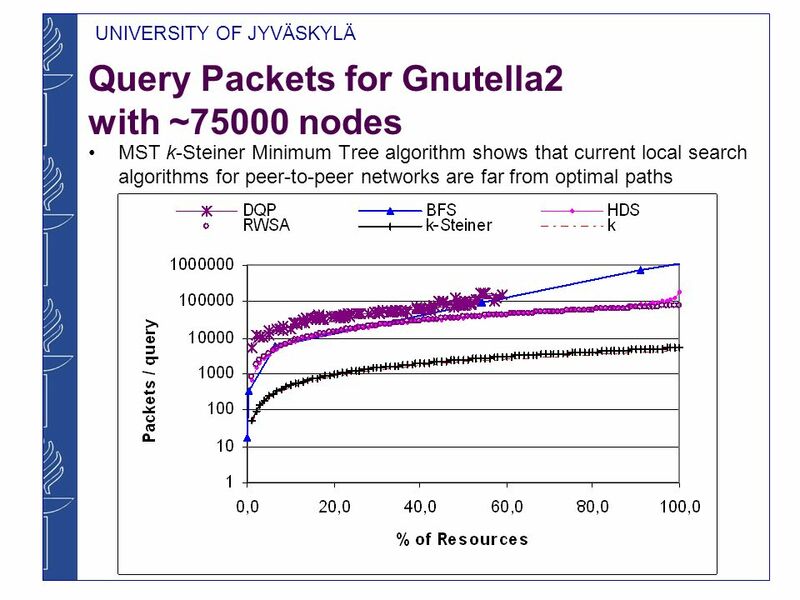 UNIVERSITY OF JYVÄSKYLÄ Resource Discovery in P2P Networks Using Evolutionary Neural Networks Presentation for International Conference on Advances in. 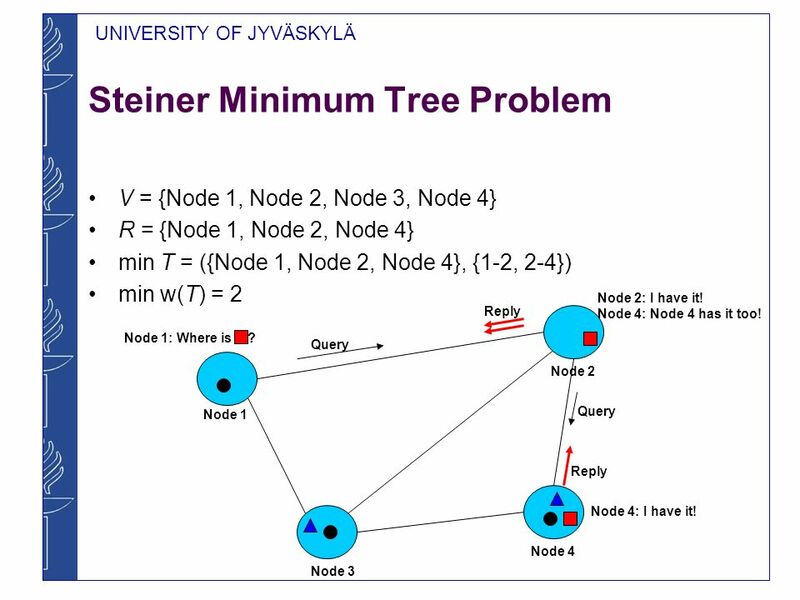 UNIVERSITY OF JYVÄSKYLÄ P2PDisCo – Java Distributed Computing for Workstations Using Chedar Peer-to-Peer Middleware Presentation for 7 th International. 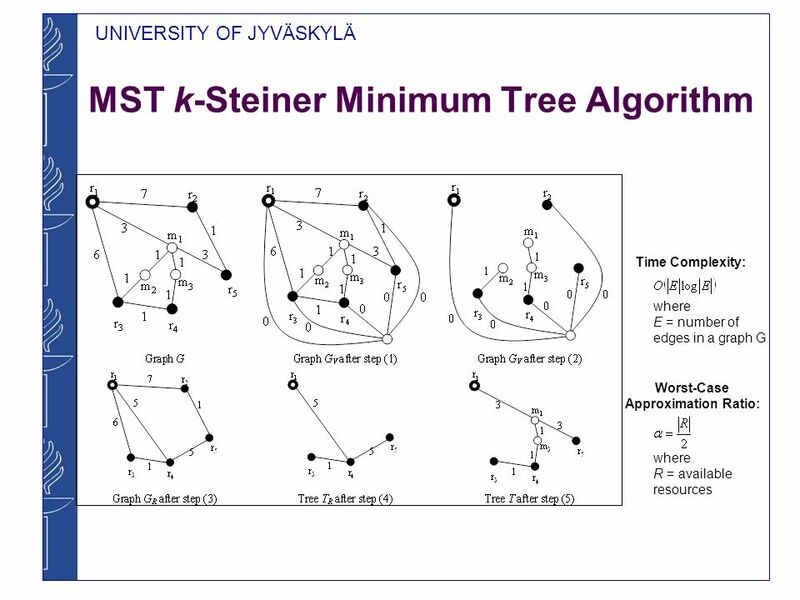 UNIVERSITY OF JYVÄSKYLÄ New Topology Management Algorithms for Unstructured P2P Networks Presentation for The Second International Workshop on P2P Systems. 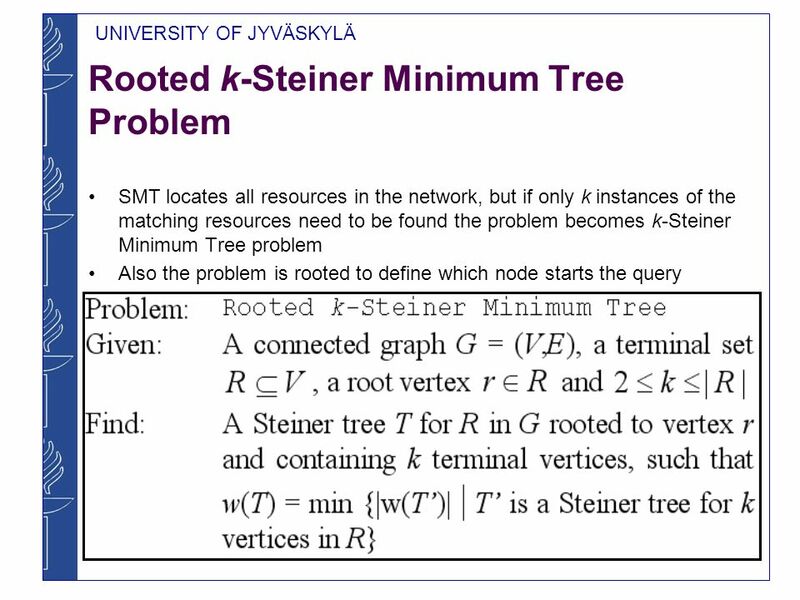 Network Design with Degree Constraints Guy Kortsarz Joint work with Rohit Khandekar and Zeev Nutov. Peer-to-Peer and Social Networks An overview of Gnutella. 1 Routing Protocols I. 2 Routing Recall: There are two parts to routing IP packets: 1. How to pass a packet from an input interface to the output interface. Inferring Peer Centrality in Socially-Informed P2P Systems Nicolas Kourtellis, Adriana Iamnitchi Department of Computer Science & Engineering University. The strength of routing Schemes. Main issues Eliminating the buzz: Are there real differences between forwarding schemes: OSPF vs. MPLS? Can we quantify. 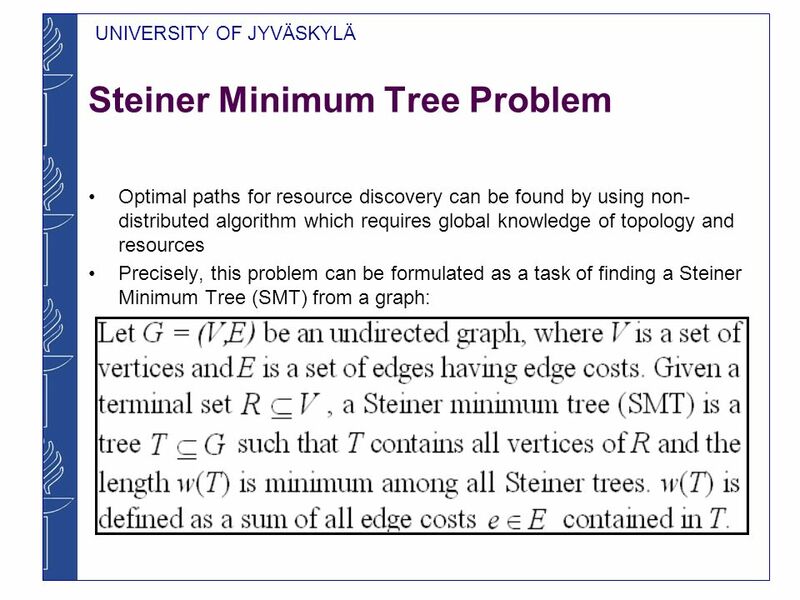 演 算 法 實 驗 室演 算 法 實 驗 室 On the Minimum Node and Edge Searching Spanning Tree Problems Sheng-Lung Peng Department of Computer Science and Information Engineering. Routing and Congestion Problems in General Networks Presented by Jun Zou CAS 744. Ch. 12 Routing in Switched Networks Routing in Packet Switched Networks Routing Algorithm Requirements –Correctness –Simplicity –Robustness--the. DIJKSTRA’s Algorithm. 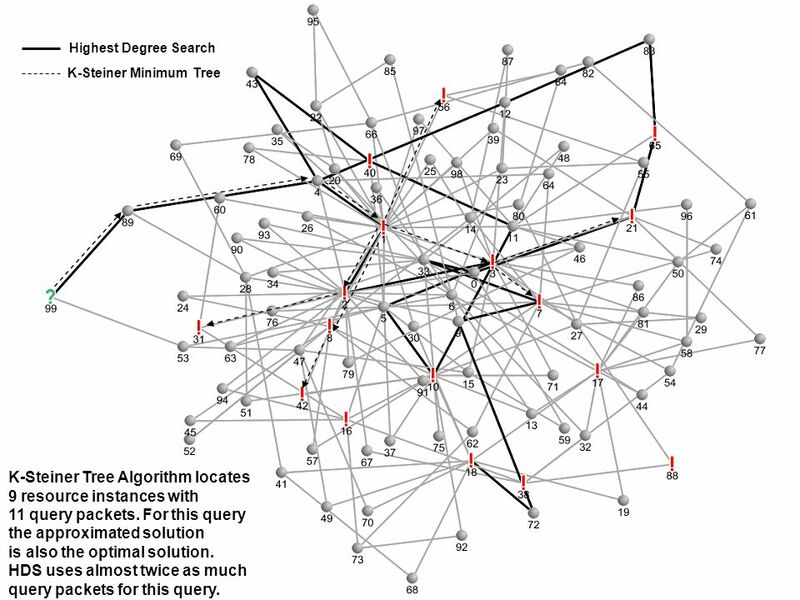 Definition fwd search Find the shortest paths from a given SOURCE node to ALL other nodes, by developing the paths in order of increasing. UNIVERSITY OF JYVÄSKYLÄ Resource Discovery in Unstructured P2P Networks Distributed Systems Research Seminar on 22.3.2007 Mikko Vapa, research student.